Veteran choreographer Peggy Baker has been creating dance in Toronto for more than forty years, but until now has only made shorter works, most of them solos. She’s an artist who understands the power of doing just what she means to do, no more and no less. It takes courage and intelligence to be that clear. But with every choice she’s made over the last four decades, it seems that something else has been at work for Baker, something slowly building beneath the surface that’s now being let out. On April 24, locus plot debuted at the Betty Oliphant Theatre, Baker’s first ever full evening ensemble performance, and her biggest, longest, and most ambitious work to date. What inspired this sudden, late career expansiveness? Mathematics. 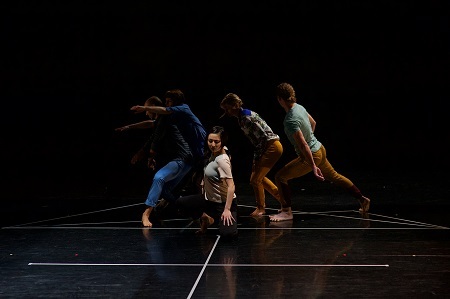 At a pre-show talk on opening night, Baker described how she recognized the similarities between choreography and certain mathematical diagrams. With the help of mathematician John Mighton, she was able to shape that original inspiration into meaningful choreography. Like the name suggests, locus plot explores how defined spaces determine the patterns and trajectories they contain. It speaks to how conditions decide outcomes, and how shapes tell stories. As source material, mathematics clearly works for Baker. locus plot brims with energy from start to finish—it’s never stagnant, it never gets stuck. The choreography is coherent but also urgent, self-contained but generative. Baker has found more than she needs to keep the work constantly evolving all the way through. Normally, when we think of art and math, we think of something exquisitely well-organized, like a Bach concerto: power perfectly contained, like a steel ball floating in the air, or a tornado on the tip of a pin. Baker’s mathematical aesthetic shares some of that rigorously clean design, but she focuses less on the structural side of math, and more on math as a means of exploration. Baker likes the kind of math that’s scribbled on paper by someone feeling in the mind’s darkness, trying to solve a problem. In this way, Baker’s work wards off resolution and preserves a sense of tension. Thankfully, locus plot isn’t closed like an equation—no matter what you do to an equation, the two sides are always equal—but open like an enigma. Each element is clearly stated in the dancer’s movements, but the way they fit together is precarious and uncertain. As creatively abundant as it is, real mathematics isn’t the point of this work, and locus plot falters when it gives up on texture and suggestion in favour of didactic illustration. At one point, the dancers start naming the geometric parts of a circle—centre, circumference, diameter, radius—in robotic voices (because that’s what math sounds like), as if this isn’t a plot at all but a diagram that needs to be labelled. The recurring wall projections of ambiguous mathematical drawings also feel too overt, like a commentary that keeps interrupting. But those few moments only seem heavy-handed because the rest of the work is so consummately well-made. Baker’s collaborators are all excellent. Her dancers—Ric Brown, Sarah Fregeau, Kate Holden, Sean Ling, Sahara Morimoto—are equally powerful and each distinctly interesting, and Marc Parent’s lighting design is masterfully subtle and effective. But locus plot wouldn’t have achieved its stunning balance of tendril-like searching and driving acuteness without the contributions of composer/performer John Kameel Farah and vocalographer Fides Krucker. Farah plays onstage throughout the performance, interweaving ambient electronic sounds with a synthesizer and piano. Krucker’s compositions are heard through the voices of the dancers, who channel a range of familiar-yet-surprising sounds through their movements—yawns that morph into ghoulish complaints, buzz-saw laments, wheezing bellows and tumbling roars. Baker’s mathematical inspiration makes this work what it is, but even if I hadn’t known about any of that, I’m sure that locus plot would have affected me just as strongly. This piece isn’t good because it elucidates the properties of figures in space, but because it reveals vital dynamics between those figures and imbues them with immediacy and force. However they did it, Baker and her collaborators have made a work of arresting beauty and vitality. Go. locus plot is running until May 3 at the Betty Oliphant Theatre (404 Jarvis St). Evening performances start at 8:30pm. Matinees on April 26 and May 3 are at 4pm. General tickets are $28, or $22 for student/senior/CADA. Tickets can be purchased here or at the box office at the Betty Oliphant Theatre one hour before the show starts.